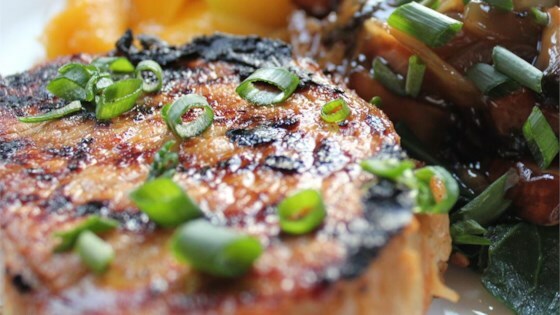 "Asian ingredients give these grilled chops lots of unique flavour. They can also be put in the oven and broiled." In a shallow container, mix together orange juice, soy sauce, ginger, orange zest, garlic, chile paste, and salt. Add pork chops, and turn to coat evenly. Cover, and refrigerate for at least 2 hours, or overnight. Turn the pork chops in the marinade occasionally. Grill pork chops for 5 to 6 minutes per side, or to desired doneness. Only change was adding 2 green onions to the marinade. Flavor was very strongly orange, yet tasty. Next time I'll increase ginger to 3 T, garlic to 1 T or more. I thought this was delish. I added some honey for glazing and extra garlic. The chops tasted great and I usually find them pretty boring. Super preparation for a hot summer evening outside on the grill. Went fantastic with grilled vegetables.